Military Animal Project offers a distinct program working with horses and veterans called the Equine Buddies Program. 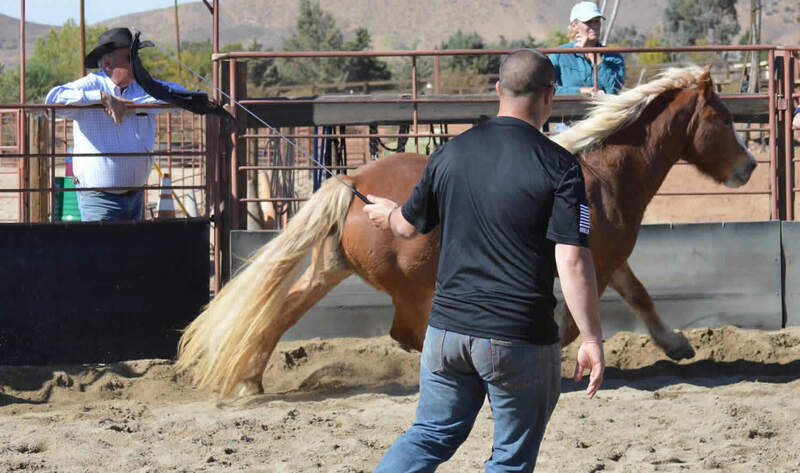 The program is a 3 day onsite equine retreat the helps the Veteran form a close bond with the horse and is an exercise in Leadership, Trust, and Respect. The opportunity to connect with your fellow Veterans/Warriors, caring people and the ultimate counselor…the horse. An atmosphere of understanding, support, growth and hope. A nurturing and emphatic environment with Veterans/Warriors of similar experiences. Enlightenment and/or healing by interacting with animals. A climate of comfort and safety for small groups and individuals. Non-judgmental environment where the horse enables the Veteran/Warrior to identify unresolved internal conflicts and develop self awareness. Certified therapy dogs are present to provide comfort to Veterans/Warriors experiencing stress. A chance to look at yourself in front of an undistorted mirror…the horse. Help with reentry/reintegration into civilian life. We are dedicated to your right to privacy. All details – names, diagnosis, experiences, etc – remain confidential within the Equine Buddies Program.